"During this initial phase of TechPort's rollout, NASA users will only be able to access the website through the nasa.gov domain, and not from iPads or computers off the NASA network. The Office of the Chief Technologist will seek employee feedback on the website, and plans to make TechPort publicly available in the future. Users will be able to browse, search, track, analyze and report on the portfolio of technology investments being pursued at program and project levels, with the resulting benefits being the easy access to information about programs and project results. NASA has announced the winners of the 2010 NASA OPTIMUS PRIME Spinoff Award. 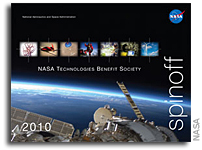 The contest encouraged students to produce short, creative videos about their favorite technology from NASA's Spinoff 2009 Publication. NASA collaborated with Hasbro using the correlation between the popular TRANSFORMERS brand, featuring its leader OPTIMUS PRIME, and spinoffs from NASA technologies created for aeronautics and space missions used here on Earth. The goal was to help students understand how NASA technology 'transforms' into things used daily. Continue reading NASA OPTIMUS PRIME Spinoff Award.